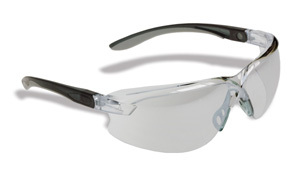 North's Rebel™ Series eyewear helps you make compliance easier and more cost effective. The Rebel™ Series provides a high 9 base curve unilens for excellent protection and sporty styling with attitude. Special features provide for a custom fit and all day comfort and North's exclusive 3A coating offers extended lens life; lenses available in four shades. If you need sporty full coverage safety glasses that offer you great comfort, protection, and style then the Rebel™ T8100 Series is for you. North Safety Products offers this safety spectacle with multiple lens choices for indoor and outdoor applications including a mirror lens for those working outdoors in partially shaded areas such as loading docks. The Rebel™ T8100 Series is available exclusively in the U.S.A.
North Safety Products manufactures leading eyewear such as the N-Vision™ Series including N-Vision eyewear with Rx insert, the classic Norton 180® protective eyewear, OG over the glasses protective eyewear, basic economy eyewear, visitor spectacles, impact goggles, splash goggles, face shields, and welder's goggles. North Safety Products also offers refillable lens cleaning stations, disposable lens clean stations, fog free lens cleaner, lens cleaning towelettes, spectacle cases, cords & holders, and hard hat goggle clips to compliment our full line of Eye and Face Protection products. To learn more about our Rebel™ T8100 Series Safety Glasses and North Safety Products' full line of protective eyewear please call us toll free at 888-422-3798 or email us at marketing@northsafety.com. Visit us on the web at northsafety.com to use our distributor locator.